Jesus Christ cannot be separated from his teachings. Aristotle says to his disciples, “Follow my teachings.” Socrates says to his disciples, “Follow my teachings.” Buddha says to his disciples, “Follow my meditations.” Confucius says to his disciples, “Follow my sayings.” Muhammad says to his disciples, “Follow my noble pillars.” Jesus says to his disciples, “Follow me.” In all other religions, a follower can follow the teachings of its founder without having a relationship with that founder. Not so with Jesus Christ. The teachings of Jesus cannot be separated from Jesus himself. Jesus Christ is still alive and he embodies his teachings. It is a profound mistake, therefore, to treat Christ as simply the founder of a set of moral, ethical, or social teaching. The Lord Jesus and his teaching are one. The Medium and the Message are One. Christ is the incarnation of the Kingdom of God and the Sermon on the Mount. Being a follower of Jesus does not involve imitation so much as it does implantation and impartation. Incarnation–the notion that God connects to us in baby form and human touch—is the most shocking doctrine of the Christian religion. The incarnation is both once-and-for-all and ongoing, as the One ―who was and is to come now is and lives his resurrection life in and through us. Incarnation doesn’t just apply to Jesus; it applies to every one of us. Of course, not in the same sacramental way. But close. We have been given God’s “Spirit” which makes Christ “real” in our lives. We have been made, as Peter puts it, “partakers of the divine nature.” How, then, in the face of so great a truth can we ask for toys and trinkets? How can we lust after lesser gifts and itch for religious and spiritual thingys? We’ve been touched from on high by the fires of the Almighty and given divine life. A life that has passed through death – the very resurrection life of the Son of God himself. How can we not be fired up? To put it in a question: What was the engine, or the accelerator, of the Lord’s amazing life? What was the taproot or the headwaters of his outward behavior? It was this: Jesus lived by an indwelling Father. After his resurrection, the passage has now moved. What God the Father was to Jesus Christ, Jesus Christ is to you and to me. He’s our indwelling Presence, and we share in the life of Jesus’ own relationship with the Father. There is a vast ocean of difference between trying to compel Christians to imitate Jesus and learning how to impart an implanted Christ. The former only ends up in failure and frustration. The latter is the gateway to life and joy in our daying and our dying. We stand with Paul: “Christ lives in me.” Our life is Christ. In him do we live, breathe, and have our being. “What would Jesus do?” is not Christianity. Christianity asks: “What is Christ doing through me … through us? And how is Jesus doing it?” Following Jesus means ―trust and obey (respond), and living by his indwelling life through the power of the Spirit. Jesus Christ was not a social activist nor a moral philosopher. To pitch him that way is to drain his glory and dilute his excellence. Justice apart from Christ is a dead thing. The only battering ram that can storm the gates of hell is not the cry of Justice, but the name of Jesus. Jesus Christ is the embodiment of Justice, Peace, Holiness, Righteousness. He is the sum of all spiritual things, the “strange attractor” of the cosmos. When Jesus becomes an abstraction, faith loses its reproductive power. Jesus did not come to make bad people good. He came to make dead people live. It is possible to confuse an academic knowledge or theology about Jesus with a personal knowledge of the living Christ himself. These two stand as far apart as do the hundred thousand million galaxies. The fullness of Christ can never be accessed through the frontal lobe alone. Christian faith claims to be rational, but also to reach out to touch ultimate mysteries. The cure for a big head is a big heart. Jesus does not leave his disciples with CliffsNotes for a systematic theology. He leaves his disciples with breath and body. Jesus does not leave his disciples with a coherent and clear belief system by which to love God and others. Jesus gives his disciples wounds to touch and hands to heal. Jesus does not leave his disciples with intellectual belief or a “Christian worldview.” He leaves his disciples with a relational faith. Christians don’t follow a book. Christians follow a person, and this library of divinely inspired books we call “The Holy Bible” best help us follow that person. The Written Word is a map that leads us to The Living Word. Or as Jesus himself put it, “All Scripture testifies of me.” The Bible is not the destination; it’s a compass that points to Christ, heaven’s North Star. The Bible does not offer a plan or a blueprint for living. The “good news” was not a new set of laws, or a new set of ethical injunctions, or a new and better PLAN. The “good news” was the story of a person’s life, as reflected in The Apostle’s Creed. The Mystery of Faith proclaims this narrative: “Christ has died, Christ has risen, Christ will come again.” The meaning of Christianity does not come from allegiance to complex theological doctrines, but a passionate love for a way of living in the world that revolves around following Jesus, who taught that love is what makes life a success . . . not wealth or health or anything else: but love. And God is love. Okay, so I quoted alot of it. I really found it profound. It spoke to me. Read it. Maybe it will speak to you. The most popular search term that finds this blog is, unbelievably, ‘Floyd Nolen Jones.’ Floyd Nolen Jones is the author of Which Version is the Bible?, a book I reviewed a few years ago. I read the book because I had recently been exposed to “King-James-only” types (otherwise known as “King James or else”). Dr. Jones’ book appears to me to be one of the top books explaining this King-James-only view. … Yet thou shalt be brought down to hell. but you are brought down to the grave. Indeed, the New American Standard and all the modern versions read almost exactly like the NIV (except the NKJV). Yet historically Isaiah 14 has been cited throughout the Church as the singular biography and identification of Lucifer [citation omitted]. In verse twelve of the King James, Lucifer is in heaven; in verse fifteen Satan is in hell, and the continuing context establishes that Lucifer and Satan are one and the same being. The new versions have removed the name “Lucifer” thereby eliminating the only reference to his true identity in the entire Bible — yet the change in these versions is not the result of translation from the Hebrew language. The Hebrew here is helel, ben shachar, which translates, “Lucifer, son of the morning” (as is found in all the old English translations written before 1611 when teh KJB was published). The NIV, NASB et al. read as though the Hebrew was kokab shachar, ben shachar or “morning star, son of the dawn” (or “son of the morning”). But not only is the Hebrew word for star (kokab) nowhere to be found in the text, “morning” appears only once as given in the KJB — not twice as the modern translations indicate. Moreover, the word kokab is translated as “star” dozens of other times by the translators of these new “bibles”. Their editors also know that kokab boqer is “morning star” for it appears in plural form in Job 38:7 (i.e., morning stars). Had the Lord intended “morning star” in Isaiah 14, He could have eliminated any confusion by repeating kokab boqer there. God’s selection of helel (Hebrew for Lucifer) is unique as it appears nowhere else in the Old Testament. Moreover, Revelation 22:16 (also 2:28 and II Pet. 1:19) declares unequivocally that Jesus Christ is the “morning star” or “day star” (II Pet. 1:19, cp. Luk. 1:78; Mal. 4:2), meaning the sun — not the planet Venus. Thus it must be understood that the identification of Lucifer as being the morning star does not find its roots in the Hebrew O.T., but from classical mythology and witchcraft where he is connected with the planet Venus (the morning “star”). The wording in the modern versions reads such that it appears the fall recorded in Isaiah 14 is speaking of Jesus rather than Lucifer the Devil! The rendering of “morning star” in place of “Lucifer” in this passage must be seen by the Church as nothing less than the ultimate blasphemy. The NASV compounds its role as malefactor by placing II Peter 1:19 in the reference next to Isaiah 14 thereby solidifying the impression that the passage refers to Christ Jesus rather than Satan. But Lucifer (helel) does not mean “morning star”. It is Latin (from lux or lucis = light, plus fero = to bring) meaning “bright one”, “light bearer” or “light bringer”. Due to the brightness of the planet Venus, from ancient times the word “Lucifer” (helel) has been associated in secular and/or pagan works with that heavenly body. Among the modern versions, only the King James (and NKJV) gives proof that Lucifer is Satan. Without its testimony this central vital truth would soon be lost. This fact alone sets the King James Bible apart from and far above all modern would-be rivals. Truly, it is an achievement sui generis. Indeed, the older English versions (the 1560 Geneva etc.) also read “Lucifer”. The clarion has been faithfully and clearly sounded (I Cor. 14:8). If the reader is not greatly alarmed by the above, it is pointless for him to continue reading. However, if concern has been aroused as to how this deception has been foisted not only upon the Christian Church, but on the general public as well — read on. The story lies before you. Well, I have to say, these first two pages did not greatly alarm me. Perhaps they should have, but they didn’t. In the scriptures, the name of God is most significant and understandably so. It is inconceivable to think of spiritual matters without a proper designation for the Supreme Deity. Thus the most common name for the Deity is God, a translation of the original Elohim. One of the titles for God is Lord, a translation of Adonai. There is yet another name which is particularly assigned to God as His special or proper name, that is, the four letters YHWH (Exodus 3:14 and Isaiah 42:8). This name has not been pronounced by the Jews because of reverence for the great sacredness of the divine name. Therefore, it has been consistently translated LORD. The only exception to this translation of YHWH is when it occurs in immediate proximity to the word Lord, that is, Adonai. In that case it is regularly translated GOD in order to avoid confusion. It is known that for many years YHWH has been transliterated as Yahweh, however no complete certainty attaches to this pronunciation. So, in summary, the Name of God is incredibly important, or essential, so we have left it out. Instead, we have translated His Name as the title LORD, which is, incidentally, how we translate one of his titles, so to avoid confusion, rather than translating His Name as Yahweh and his title as Lord and the two together as Lord Yahweh, we will translate His Name as LORD, his title as Lord, and the two together as GOD. Just to avoid confusion. Deleting the Name of Yahweh from the Bible is far more offensive to me than deleting the name of Lucifer. Philippians 3:20a states, “But our citizenship is in heaven.” I have always heard this and wondered what it meant. Does this mean we should renounce our citizenship of any country in this world? Satan is the prince of this world. John 12:31, 14:30, 16:11. He had authority to grant the kingdoms to Jesus. Matthew 4:8-10. Satan has been given all the authority and splendor of the kingdoms. Luke 4:5-8. Additionally, when Satan claimed to have authority over the kingdoms of this world, Jesus did not dispute these claims. Matthew 4:10, Luke 4:8. I understand that Romans 13 says that the governing authorities were established by God, just as Satan was established by God as the prince and authority of this world. God permits Satan to work out his ministry of death in this age, using the governing authorities as his tool. There are many who attempt to combine Christianity and patriotism in claims that patriotism is right and good for a Christian. I now doubt such statements. There are many alive today that profess Christianity who will not make it into the Kingdom of Heaven. You may think I am referring to C&Es, but I’m not. Read the passage again, these people who will be rejected prophesied in the name of Jesus and drove out demons and performed miracles. These are Christians who truly believed they were on the right path and I would hazard a guess that those around them thought them to be mighty followers of Christ. But they are deceived. 24Meanwhile a Jew named Apollos, a native of Alexandria, came to Ephesus. He was a learned man, with a thorough knowledge of the Scriptures. 25He had been instructed in the way of the Lord, and he spoke with great fervor and taught about Jesus accurately, though he knew only the baptism of John. 26He began to speak boldly in the synagogue. When Priscilla and Aquila heard him, they invited him to their home and explained to him the way of God more adequately. 27When Apollos wanted to go to Achaia, the brothers encouraged him and wrote to the disciples there to welcome him. On arriving, he was a great help to those who by grace had believed. 28For he vigorously refuted the Jews in public debate, proving from the Scriptures that Jesus was the Christ. 4Paul said, “John’s baptism was a baptism of repentance. He told the people to believe in the one coming after him, that is, in Jesus.” 5On hearing this, they were baptized into the name of the Lord Jesus. 6When Paul placed his hands on them, the Holy Spirit came on them, and they spoke in tongues and prophesied. 7There were about twelve men in all. Look at Apollos. His qualifications would seem to be complete to most professing Christians today; He is learned, has a thorough knowledge of the scriptures, instructed in the way of the Lord, spoke with great fervor, and he taught about Jesus accurately. But Apollos is evidence that there is a difference between knowing about Jesus and knowing Jesus. And this passage is evidence that there is a great mission field among professing Christians. There is an opportunity for modern Priscillas and Acquilas to explain The Way more adequately. 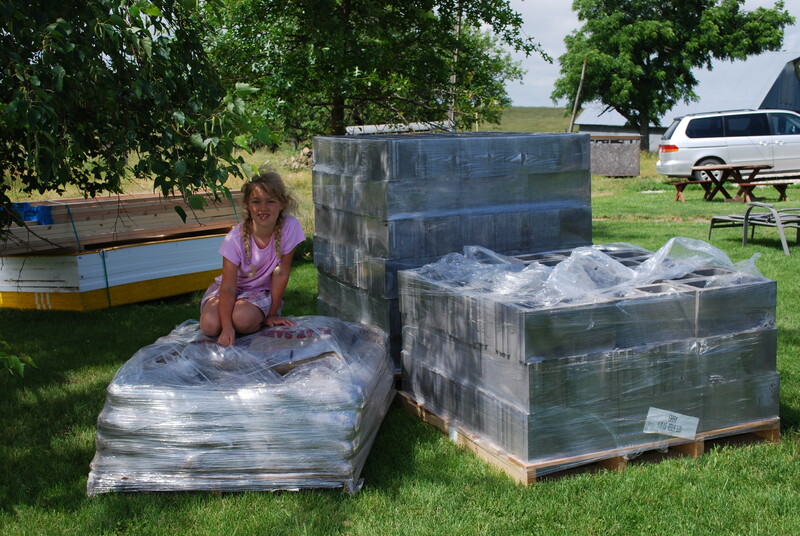 Yesterday we got a delivery from Menard’s with most of the heavy items we will need to get started in building the greenhouse. 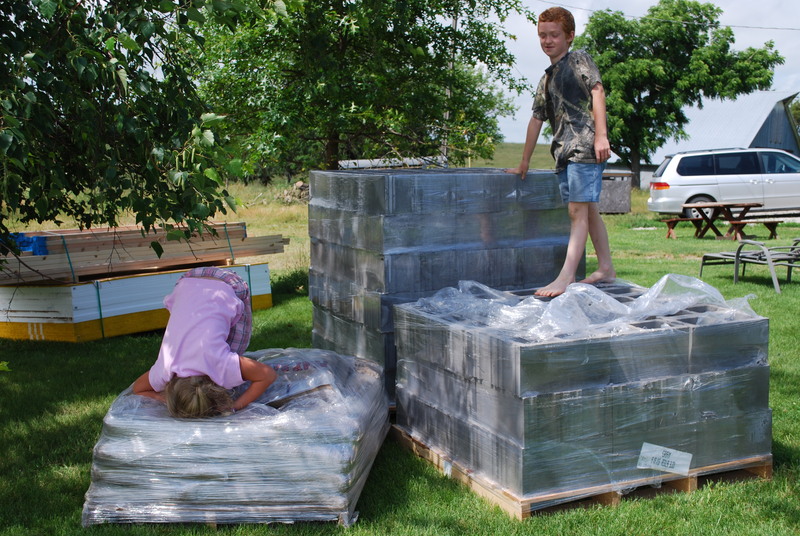 Each of the cement blocks weighs 38 lbs, so I would have only been able to move 25 blocks per load. This represents then about 8-9 trips to the store. Having it delivered is a bargain at almost any price. We have been digging the trench for the footings and we are almost complete. I covered the dig yesterday to hopefully keep most of the rain out of the trench. The rest of this week is temperatures in the 90s with 30% chance of rain, so I will hope to fall in the 70% chance of no rain and finish off the trench Thursday so I can pour the footings on Friday. I will plan to finish the trench and lay rebar on Thursday. I keep waffling over the size of the footings. The latest thing I read said to make the footings 16″ wide rather than 12″ wide. My wife created a blog just for offerings from our farm, U-Turn Family Farm. Today, she posted that we have pastured pork available. You can check it out here. We have pastured pork to offer for sale! The pigs will be sold based on their live weight (ranging from 160-230 lbs), at $1/lb, and delivered to a Johnson County meat locker. From there, you can pick up your meat or we can arrange a delivery. You are responsible for processing costs. If a whole pig is too much meat, find a friend who would be willing to split it with you! These pigs were raised on their mama for the first 4 months of life. Then, they were moved out to a large 2-acre pasture where they root and dig to their heart’s content. They eat on pasture, as well as some supplemental feed. Contact us by email if you’d like more information on getting your pastured pork. Now that I am unemployed, I thought I would start a major project to help get rid of any excess funds I had. 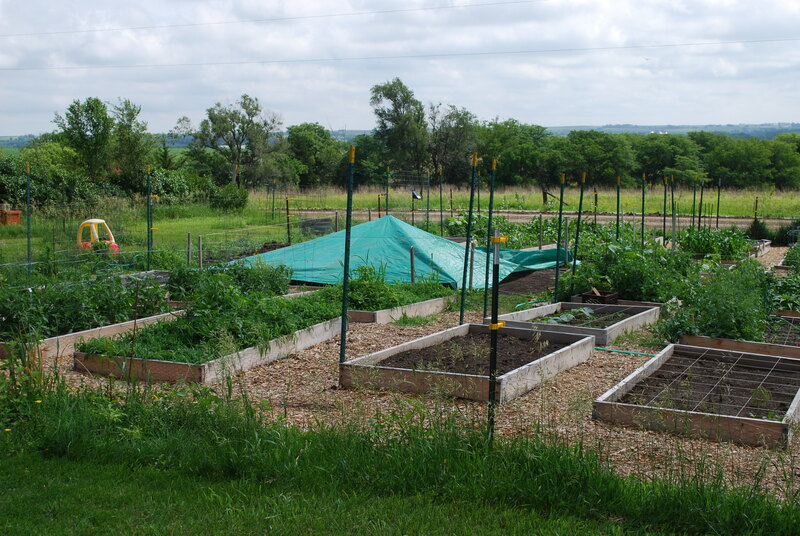 The plan is to build a ‘solar greenhouse.’ I know this sounds redundant, but the idea is that the greenhouse will be heated entirely through passive solar heat. So, the first step was to get an idea of where the sun marches across my skies. There are many ways to do this, the oldest and best probably being observation. But I cheated. I looked it up on the internet using the University of Oregon’s Solar Radiation Monitoring Laboratory’s Sun Chart Program. Based on this chart, the sun will reach an elevation of 50° on March 20/21, the vernal equinox. The sun then continues to climb higher and higher in the sky until May 21, when it reaches 70° and June 21 when it reaches about 73°. I also noted that on December 21, the sun’s elevation only gets to 26°. My thought was to make all these numbers work in my favor. I definitely want/need full sun between September 21 and March 20, so I made sure the front wall does not block sun on December 21 and I made sure the roof does not block any sun on March 20. My Northern roof line is going to be 50° then, to insure that the sun can hit the back wall on March 20, and my front wall will be 48″, to ensure that the December sun is able to hit the back wall as well. The next challenge is to determine how far out to make the solid Northern roof go in order to block the Summer sun from hitting the back wall of the greenhouse, in order to keep temperatures from soaring out of control in the Summer. For this, I drew a line at 70° from the base of the back wall and found where it intersected the roof line. That intersection is where I will place the peak of the roof, which is approximately 15′ above the ground level. For people more accustomed to roofing terms, this means my Northern roof will slope at 14/12 (50°) and my Southern roof will slope at 24/12 (65°). Some additional design considerations included the size of the area set aside for the greenhouse. Initially, I had set aside an area of 16’x16′ for the greenhouse. 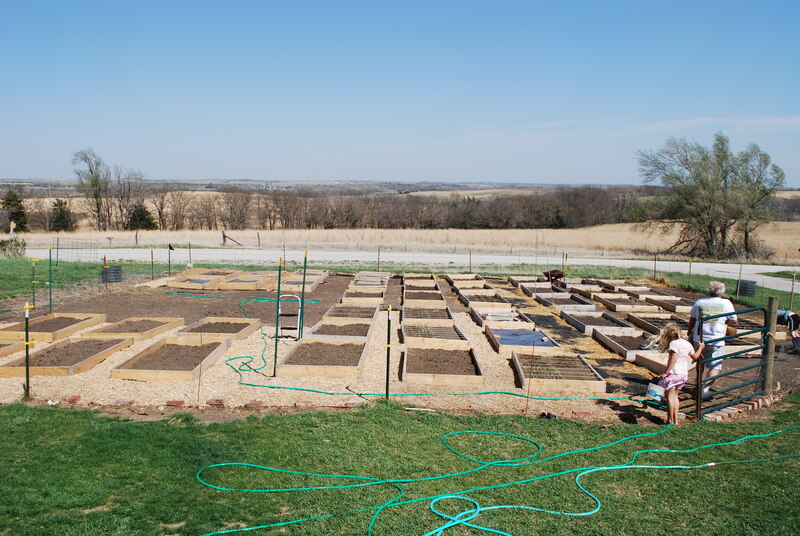 After drawing the plans repeatedly, I decided to alter the size to 12’x16′, leaving room for a cold frame along the Southern wall of the greenhouse. Also, the Northern wall will be framed with 2x6s in order to allow more insulation to keep out the cold Northern wind. 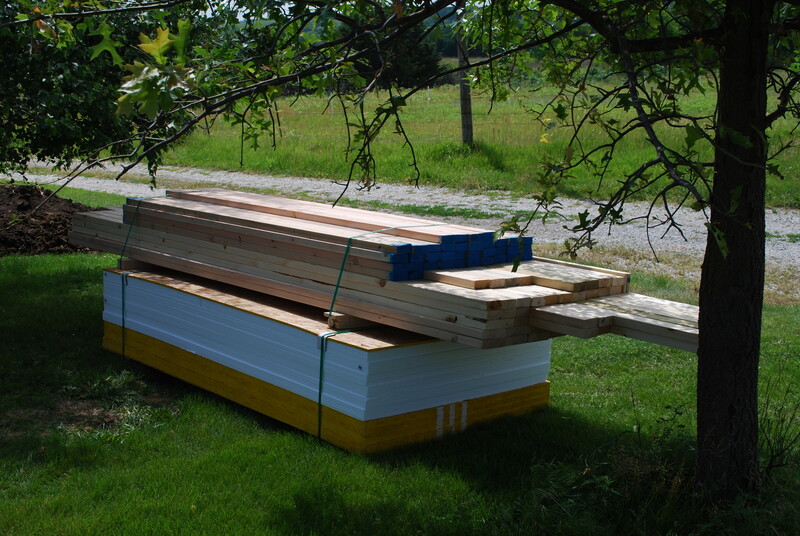 Likewise, the Northern roof will be framed with 2x6s. I plan to put a large water tank in the greenhouse as well as stones/bricks/cement blocks in order to store the solar heat as it comes in during the day. These same items will then release their heat overnight to alleviate extreme temperature fluctuations. My plan for the flooring is the most exciting yet. For the floor, I will lay down 2″-thick polystyrene insulation panels in order to insulate the cold ground from the floor of the greenhouse. I will then pour 1″ of sand over the insulation. Finally, I will install 2″ brick pavers over the sand. The brick pavers will allow the solar heat to be stored in the floor while also providing a pleasing floor for users of the greenhouse. The least exciting part is the foundation. I will be going 3′ deep in order to avoid frost heave that would potentially ruin my new struction. This will be accomplished by pouring a footer that reaches 3′ down, then stacking cement blocks on the footer until I get above ground level. I calculate I will need 2 cubic yards of concrete for the footers and 160 cement blocks for the foundation walls. The disappointing part of all this is that all that work will be covered up by dirt and (hopefully) never seen by anyone. That is alot of work to do for noone to see. So far, I have been digging out the HUGE hole that is necessary for the footer and the space I will need to work on the cement block wall. I have been helped immensely by my father-in-law, Dale, who has been driving down to help out on our rare days when it is dry enough to dig. I know this is an entirely unsatisfying picture, but it isn’t wholy irrelevant. You can see the large dirt space on the left side of the picture, which is where the greenhouse is being built. Also, the two people in the picture are my daughter and my father-in-law Dale. Today, I am a changing man. I have accepted that when Jesus said, “Love your enemies,” He meant it. And the Bible doesn’t say it just once. The Bible repeats itself in Romans 12 and Hebrews 12. I know that there are those who would say that there are many examples of warriors approved of God (David is the prime example). But it is important to note that these Old Testament warriors were warring on behalf of God’s chosen people; they were warring on behalf of Yahweh, who told them to go up and fight these people. But Jesus says in the New Testament, when talking to Pilate, “My kingdom is not of this world. If it were, my servants would fight to prevent my arrest by the Jews. But now my kingdom is from another place.” I will fight on behalf of Jesus’ kingdom, but His kingdom is not of this world. There are others who distinguish personal commands from the authority given to governments. This is a much harder distinction to work through. For today, I will simply repeat that Jesus’ kingdom is not of this world. The prince of this world is Satan. And all the kingdoms of this world fall under his authority. And I will not be an officer of a kingdom of Satan. So, I am firmly convicted that Jesus wants me to live a life of non-violence. Which conflicts with my status as a member of the United States Air Force as well as my employment as an administrator with a state prison. So I knew that I would have to leave both positions. But I was making excuses for extending my time with both agencies. Until I read James 4:4, “You adulterous people, don’t you know that friendship with the world is hatred toward God? Anyone who chooses to be a friend of the world becomes an enemy of God.” If I am in an adulterous relationship outside of my relationship with God, I am sure He wants me to end it immediately, rather than make excuses for continuing my infidelity. So I ended my relationship with the Air Force and with the Nebraska Department of Correctional Services. May 29 was my last day with the Air Force. And June 12 is my last day with the prison. And no, I don’t have anything lined up. But I will talk more about that next time.